The nocturnal face has an outer zodiac scale with the names of the constellations (sometimes abbreviated) and each sign has a scale 0 to 30, divided to 10, subdivided to 2.5, numbered by 10. A moveable ring is supported by two diametric bars and is divided into hours by 24 points, the two representing 12 o'clock being extended to the zodiac scale. Beneath the ring, or pierced disc, is a date scale with the letters of the months, the days numbered by 10 but not accurately divided to single days. This can be used instead of the zodiac sign; the first point of Aires corresponds to 10 March. 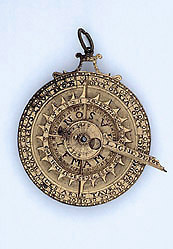 This face also incorporates a lunar volvelle, and the ring has a scale 1 to 29 for the age of the moon. Above the ring is a disc with a small horizontal sundial. The disc is pierced to show the phase of the moon, and has an extended index arm for the nocturnal, marked 'LIGNE? DE? FOI'. The sundial face has a vertical disc dial, with a pivoted index arm carrying a folding gnomon. There are two calendar scales marked with the initials for the months and divided to quarter months, for setting the position of the gnomon for the date, and on the opposite side of the disc scales for ordinary and Italian hours, the former divided to quarter, the latter to half hours. There is a shaped and pierced throne for a suspension ring, and a raised blank shield.